Preparing for infants goes a long way when you're making choices on clothes. Even more, when it comes to changing your infant's clothes a few times on a daily basis. You'll want easy-on as well as easy-off outfits that are hassle free and effortless especially during routine diaper changes. Ultimately, we will want ultra-soft clothing that's delicate for their sensitive skin yet wears comfortably snug and warm that makes dressing your baby everyday easy. With our New Infants Interlock Collection, we currently carry three comfortable style bodies. The Infants Lap Shoulder Short Sleeve, Long Sleeve Bodysuits one-piece outfits and Long Sleeve Gown features lapped shoulders for an easy slip-on over your baby's head and a stylish finish. The Infants Interlock Short Sleeve and Long Sleeve Bodysuits feature 3 snap buttons at the crotch for a convenient snap-on and snap-off during diaper changes yet offering a secure snug-fit. If you're looking for something more effortless, our Infants Interlock Long Sleeve Gown features a gathered elastic bottom that helps ensure a comfy snug fit while the opening at the bottom of the gown allows easy diaper changes. Designed with lapped shoulders for an expandable neckline for easy dressing and long sleeves to keep your baby warm. 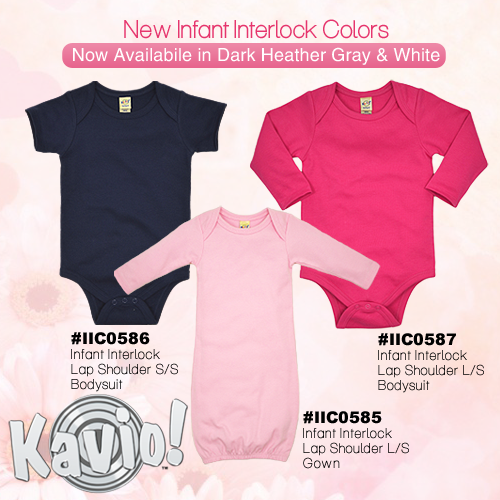 Our Infants Interlock Collection is now available in additional Infant Sizes starting at 3 Months! And we've just added 2 new colors! Dark Heather Gray and White is now available in the Infant's Lap Shoulder Short Sleeve and Long Sleeve Bodysuits and Long Sleeve Gown. All styles include colors: Baby Pink, Black, Dark Heather Gray, Hot Pink, Navy and White.